Whether a student's goal is to work as an IVM professional domestically or abroad, or to practice veterinary medicine locally with an international perspective, the IVM program prepares students to be knowledgeable and competitive. 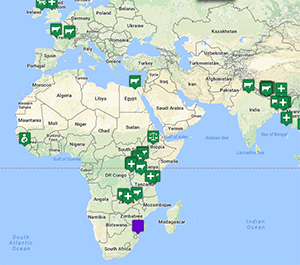 There are many different opportunities for working internationally as a veterinarian. The list below is not exhaustive but provides a starting point. Alumni have gone on from the program to work at organizations such as the Centers for Disease Control and Prevention, United States Department of Agriculture, Smithsonian Institute, Cummings School of Veterinary Medicine, Department of Defense, World Organization for Animal Health, and World Health Organization, to name a few. Here, our featured alumni share their experiences of the IVM program, and life in the veterinary profession.